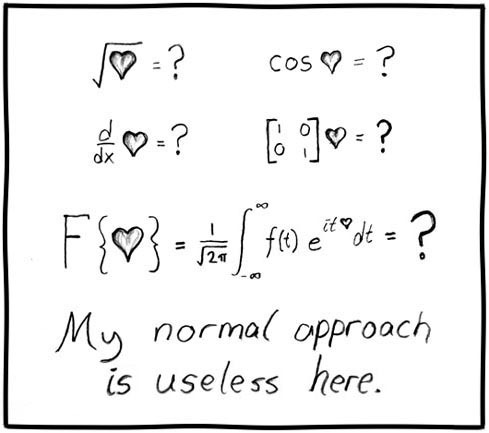 The Calculus of Saying “I Love You”: Why you should never date man who knows more math than you. Previous Post What’s special about tomorrow? Doppleganger blog? I think you got the jump on me. But I think it’s funny we both ended up choosing ~ the same title. I think this world is big enough for the both of us, let me know if you disagree. “Divide By Zero” is my blog’s name too! Nick—maybe you could consider changing your blog title to “Divide by 2” or something like that… :-) Just kidding! I’m happy to share the (similar) blog names. Have fun!